Once again this year, Kurgo is offering International Assistance Dog Week supporters a coupon code they can use to shop at www.kurgo.com. By using the 20% off coupon code, DogWeek15, you’ll not only get a great discount, you’ll help support IADW. A portion of the proceeds from purchases made with the special IADW coupon code will be donated to International Assistance Dog Week. 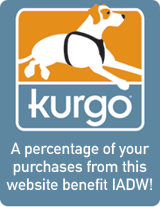 Check out the Kurgo products at www.kurgo.com, use the coupon code and get 20% off your purchase while helping to support IADW.